César, one of the most renowned artists of his age and one of the most misunderstood, passed away twenty years ago. He had become famous at the age of 25 when after having come up to Paris in 1944 he developed his welded iron sculpture technique. Misunderstood too, for the loquacity and confidence he affected in public hid a permanent dissatisfaction with the works that won him success. Far from being simply the man of the welded iron, the compressions, impressions and expansions for which he was famous, César remained attached to a sculpture peopled with animals and human figures, work he hoped equal to that of the masters he admired. He was modern in the manner of the Nouveaux Réalistes, whom he joined in the 1960s. Inventive, guided only by the logic of the material, endeavouring to give expression to the spirit of the age, he made and remade his art through decisive new moves that gained him worldwide attention. While transforming the language and practice of sculpture, he returned constantly to the techniques he had discovered when penniless, welding scrap metal. Carried by the mythic narrative of their conception, Le Poisson, La Vénus de Villetaneuse and La Ginette were the iconic representatives of that art, embodying the intimacy of the creative act and a practice that relegated nothing to machinery, dependent on the artist’s hands alone. Later, Le Centaure, a tribute to Picasso, would elicit the same passionate engagement. And César also had an interest in the question of the monument. From this opposition between hands-on passion and a practice based on industrial technology and the power of machinery, César elaborated a dialectic, a back-and-forth method, opening what his friend Raymond Hains called “sites” to which he returned over and over, inventing new tools, pushed ever further by his curiosity. 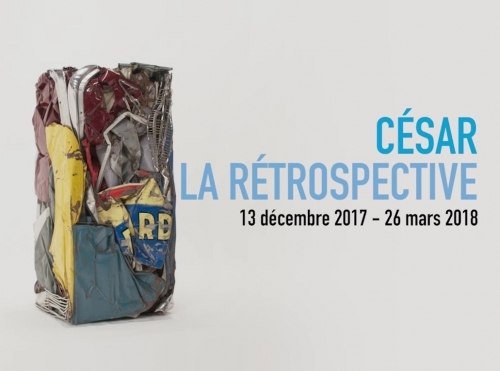 Faced with his “Envelopments” in Plexiglas sheets, his “Champions” created from crashed cars, his “Suite milanais” of new cars crushed and painted, César drew on his experiments, replaying them as exercises, guided by a reflection on the language of sculpture in the time of modernity. At Cluny in 1996, he still strove “to do new things again”. Emerging in the Paris of post-war Montparnasse and Saint-Germain-des-Prés, César’s work was a perpetual self-interrogation in a vein close to that of Picasso, Giacometti and Germaine Richier, among others. 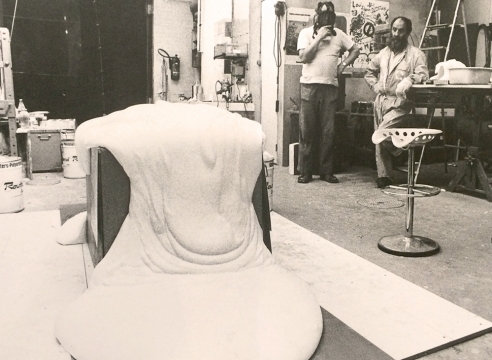 The decisive moments that gave his work as a whole an unequalled sense of unfolding development and granted it a paradigmatic status in the world of 20th century sculpture were paralleled by works that maintained the sense of hands-on subjective engagement that he himself was doing so much to make redundant. This very complexity issued in a body of work magnificent and inimitably distinctive, even if some were quick to compare it to developments elsewhere, in the US in particular. Time has passed, and with it have departed the judges who delighted in criticising the man, refusing to grant him the place of importance that this exhibition seeks to show was his due.